So you got the invite and you’re now happily sharing stuff with your friends on Google+. If you want to access Facebook and Twitter within Google’s social network, there are browser extensions that make this possible. In a previous post I introduced the Crossrider Google+Facebook browser extension which lets you access your Faceboook stream and post status inside Google+. Now you can also access your Twitter stream and tweet inside Google Chrome through another browser extension called Google+Twitter. Google+Twitter is developed by Bruno Barbieri but is also based on the same Crossrider platform. You can download the install file here. Simply download and install Google+Twitter, log in to your Google+ account and log in to Twitter while inside Google+. Your Google+ stream should now look like this. 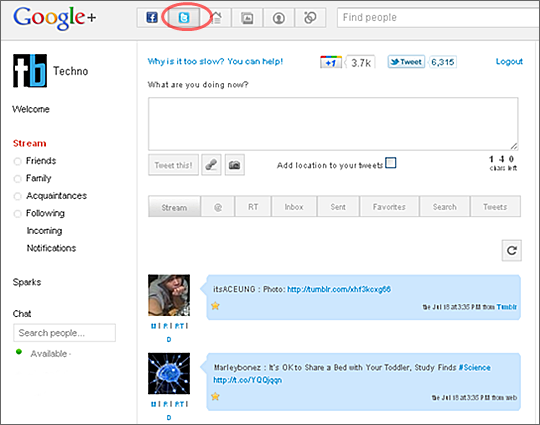 Google+Tweet is available on Google Chrome, Firefox and Internet Explorer.